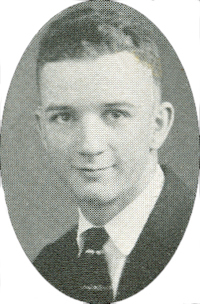 Obituary – Foster, Ned Raymond « Perry High School Alumni Association, Inc.
﻿Graveside rites have been set for 1 p.m. Wednesday at Grace Hill cemetery at Perry for Ned R. Foster, 83, Enid, formerly of the local community. Foster died Sunday at Highland Park Manor at Enid. Rev. Melvin R. Duncan will officiate. Family and friends may call at Henninger-Allen Funeral home at Enid prior to the service. The casket will remain closed at the cemetery. Foster was the son of Joseph H. and Effa Cora (David) Foster. He was born at Perry, July 20, 1907. He and Rena L. Purdy were married at Winfield, Kan., Sept. 11, 1928. A veteran of World War II, Foster was a pharmacist’s mate in the United States Navy. He served at Naval hospitals at Corpus Christi, Texas, and in New Orleans, La. In addition, he served 21 months in the Pacific, aboard the USS Edmonds. He and his wife made their home in Perry where he was employed at Nelson Drugs. In 1949, the couple moved to Enid. Foster was an employee of Sanford-Stunkle and Evans Drug. He retired in 1985 from Evans West Gate. He was a member of the American Legion, post No. 4 of Enid. In addition to his wife, Foster is survived by one sister, Mrs. Orie (Eva) Nida, Perry; and a number of nieces and nephews. He was preceded in death by three brothers and three sisters. Memorials may be made at the funeral home to benefit the American Legion Children’s home at Ponca City.